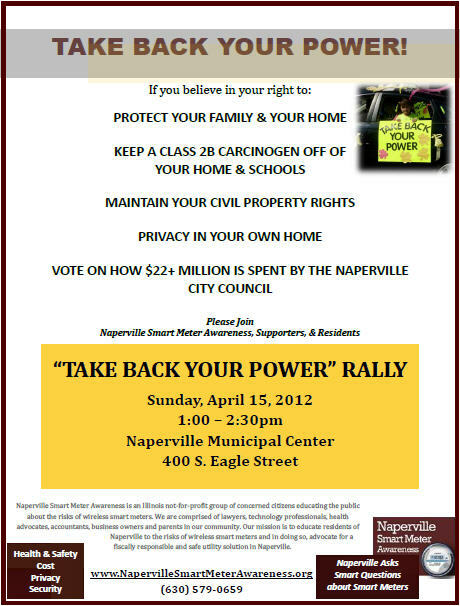 Over 4000 citizens signed petitions opposing the installation of Smart Meters in Naperville. One person objected to those 4000+ citizen-signatures and petitions. When political posturing on the part of the Naperville city government machine completed rolling over Naperville citizens, one-person’s whims outweighed the wishes of thousands of dedicated citizens. The vote of those citizens was denied. That vote will not be denied in the next Naperville city council election. Until that time, let your collective voice be heard this Sunday at the “Take back your power rally”. The transportation was oriagnilly managed through the comission on aging. The commission transferred the jurisdiction to the Langlade County Board Executive Committee. This entity now oversees the program. The transportation program is funded completely by grant funds. The cuts were necessary for funding shortfalls. However, I read recently that there was a $5000 supplemental payment given to the Finance Director overseeing the progrem. Why was there enough funding to pay the supplemental payment but not enough funding for routes? We also fund a route into Shawano County, are we receiving funds from Shawano County for this service. It may be funded by grants, but if the grant is written for OUR resident, then OUR residents should be the ones the service is targeted toward.